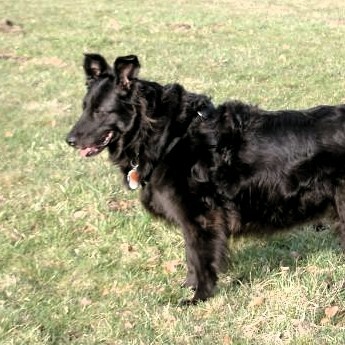 Chica (Groenendael-Mix) came to our house one day after Nicki's death in 1991. She was the exact opposite of our first dog: She didn't avoid any fight and actually we were initially totally overburdened with her. We didn't understand at all that this dominant behaviour resulted from insecurity. Good dog schools were not readily available at that time. We went through a lot with each other and with time grew firmly bonded. She was a very big personality and the absolute boss of the pack, even the last two years, when she was in bad health and blind.